Sorry to have to tell you but my brother Joe Shenton passed away today at a hospital in Kettering. Joe played washboard with the River City Jazzmen for three decades after the birth of the Band in the late fifties. I last played with him at the Great Whittington Jazz Picnic in August 2010. His amazing washboard playing gave the band their distinctive sound. PS: Joe was 82. his funeral is on Friday June 15 at Kettering Crem. PPS: Colour pic from Brian Bennett (see comments). Here's a pic which my wife, Jan, took of Joe playing tambourine and washboard with his brother Ray's band, The Victory V Jazzmen, at Ovingham Reading Room in January 2008. 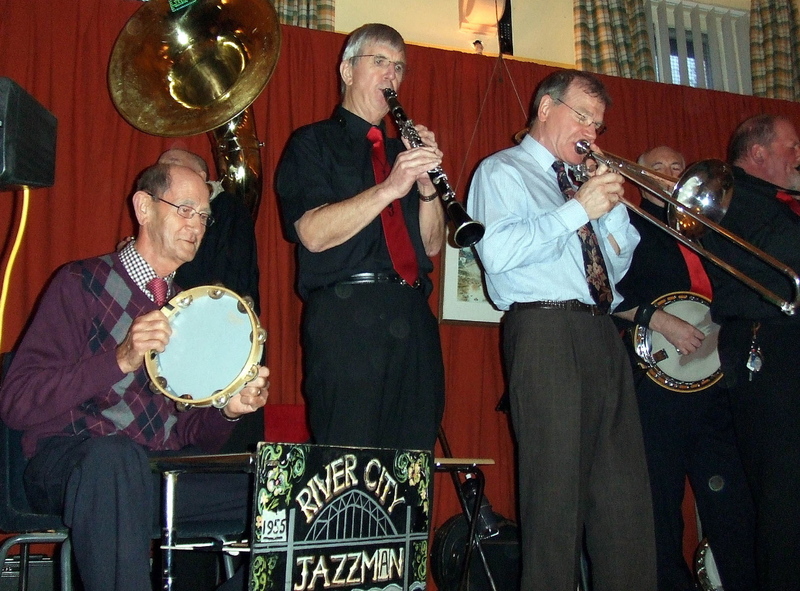 L to R: Joe Shenton; Mike Harrison, sousa; Bruce Carnaffin, clarinet; Herbie Hudson, trombone; Brian Bennett, banjo; John Cowan, trumpet; (Ray Shenton, piano, not in picture). 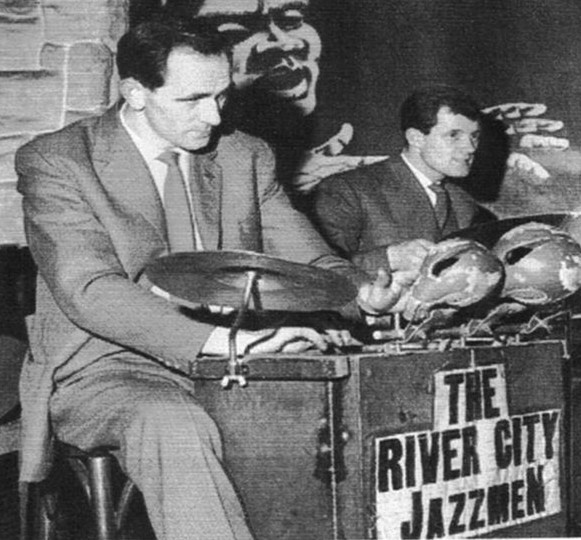 You'll notice the date on Joe's washboard is 1955, presumably the year the River City were founded. RIP Joe, a true legend on the north east jazz scene. Book Review: Candace Allen - Soul Music. CD Review - Gabriele Poso: Roots of Soul. CD Review - Joe Stilgoe: We Look To The Stars. Ray Chester Latest from Mia Web. Tomorrow (Wednesday June 27) @ The Chilli. Down Beat Critics Poll Winners 2012. The Melfi A.K.A. Val and the V's. Hot Line To Hong Kong. CD Review - Joe Leader: Seductive Sax. Next Wednesday (June 27) @ The Chilli. The Wonder of Orla Murphy. CD Review: Mole - What's The Meaning? ACV @ The Bridge Hotel. June 17. So you think you can sight read? Mark Toomey Quartet @ The Cherry Tree. CD Review - Nick Vayenas: "Nick Vayenas." Watson, Walker, Edis @ The Lit and Phil. Zoe Gilby@ The Cherry Tree. Monday June 4. A June Bride - aaaah!